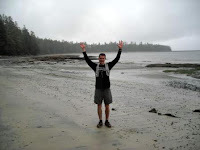 The Nootka Trail Run was a run that was actually intended for last year. However, logistically and financially it simply did not happen in time for me last summer. Once again, my buddy Bob Wall would be joining me for this epic adventure. So for over a year I have been planning, training, and gearing up for this one special day. This day would mark the conclusion of the "West Coast Conquest". Completing this run, would make Bob and I the only people to have run the 4 major coastal trails of Vancouver Island (JdF, WCT, NCT, and Nootka). Unlike the other trails, there is not much information on the Nootka Trail really out there. A good map was difficult to find, but eventually one was found and once again, I took the liberty of studying the map and the guidebook thoroughly in preparation for the big day. A few days before the run, there was some concern as to the state of Gold River. The town was on evacuation standby, as a forest fire was within 2k of the city and withing 400m of the city's powerlines. The day before the run, my parents picked me up just after lunch and we zipped up to Campbell River to pick up Bob. Bob and his wife, Tammy, picked out a pasta joint where we all had dinner. After loading up on a chipotle-blue cheese-bison pasta, we hit the open road and made our way towards Gold River. As we rounded Buttle Lake, we kept our eyes peeled for any signs of the forest fire. Coming this far, we didn't want to be stopped short of our upcoming run. About 5k away from the city, we smelled smoke and could see the hillside in smoke. It did not seem that bad, and in no time at all, we were at our hotel in Gold River. 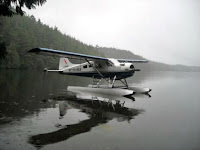 We checked into our hotel, and made a group decision to take the 13k drive to the port of Gold River, which would be where we were catching the floatplane at 6:30 am the next morning. It was an easy drive and there was not much to see at the dock, except for an active mill and a few Air Nootka floatplanes in the water. On our way back however, something caught my eye. I could see our hotel from a distance and it really looked like the top of the hotel was on fire. Smoke was bellowing up behind our hotel, and it was shocking how close this fire was to our hotel. Our hotel was full that night. Full of firefighters. Their gear was all hanging from the railings outside the hotel, and it really hit home that this town was in trouble. In the hotel room, Bob and I got all our gear sorted out. We spent a while figuring out exactly what would go in our bag (we called it "The Finishing Bag") that would be there with my parents at the finish. It was about then that I heard Bob say, "Oh Sh!t!". He said, "I forgot my shorts." After getting over the initial shock of having no shorts, Bob now recollected himself and decided he would go in style for the run. He was going to run in his boxer shorts. I took a few digs at him immediately and I told him that I'd make sure that the people back at home would soon know how an ex-national level runner could make such a stupid mistake. We then went to bed, and in no time at all, it was race day. We met Brad from Air Nootka at 6:25 am and we boarded the small Beaver floatplane. For my parents, it was an opportunity to sightsee Nootka Sound from an aerial viewpoint, something that they had wanted to do for years. 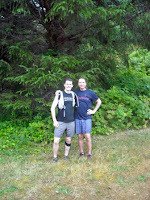 For Bob and myself, it was time to mentally prepare for the endurance event that lay ahead. The plane trip was nothing short of phenomenal. Although the weather was foggy and drizzly, the plane flew very low to the ground and we could see just how scenic this area truly was. The plane trip took us completely up the distance of the Nootka Trail, so we got to see it before we had to run it. At the top end of the trail, the plane took a sharp right turn and then started it's decent. The only problem now I could see is that the plane was descending into a forest, rather than water. However, at the last minute the trees disappeared and we descended into a place called Starfish Lagoon. I had never landed in a floatplane before, so I was expecting a hard landing. However, it was as soft as anything, and after landing, pilot Brad turned off the engine and we coasted up to the shore. As we did this, I looked into the water and now realised why it was called Starfish Lagoon. It was brilliant seeing all the hundreds of different Starfish and Batstars under the coasting plane. Bob and I then thanked the pilot, said goodbye to my parents, then hopped into the knee-deep ocean water and began our run at the flagging tape that marked the beginning of the trail. And I do not know why, but I expected the trail to be fairly well travelled initially. I imagined something like a gentle chip trail guiding us in the first couple of kilometres from Starfish Lagoon down to Third Beach. However, the opposite happened. The trail was rugged and gnarly. There was lots of blowdown logs to cross, foliage to forage through and roots galore. Flagging tape guided us a short ways down a river, but I was surprised to see us come out to Third Beach in 10 minutes. Third Beach was beautiful. 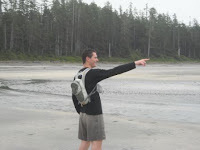 Open sand and beautiful marine coastline marked what is the Nootka Trail. We kept the ocean now to our right and skirted along the shore, not needing the high tide headland trail. The tides worked perfectly here. The tide was out and would be that way for much of the run. The planning had paid off. However, it was not long before the beach ended and we were forced into the trail. This for me was unexpected. The map I studied so carefully showed coastline running here, and for a good, long while were battled through the gnarly trail. And it wasn't easy. We did our best to get in a few running strides here and there, but we were mostly just speed hiking now through the coastal rainforest. Cedar Trees, 10 foot salal, mud and roots seemed to be the theme. I led the pace with Bob trailing behind. I kept the pace firm, but around one corner, I smashed the side of my Nathan Hydropak into a skinny tree. The tree ripped at one of my pouches, and I was now forced to carry my gels in my short pockets. Soon enough, we were now back on the beach. The tide was way out now, and Bob and I found the marine shelf perfect for running on. Perfect, except for the fact that it was damn slippery and one false step into a tiny tidepool could mean the end of the journey. Algae of all kinds coated the shelf and rocks. Some of them were just fine for running on, while others (the brown shiny one) may the surface just like ice...and we had to reduce our pace accordingly. I was feeling good at this point. The weather was ideal for running, and we were certainly covering some ground. Where the shelf became too slippery or too rocky, we headed up to the beach for some running. It was not always possible to run the beach, but we did our damndest to keep moving. It was also hard to tell exactly where we were on the trail. It was so easy to tell with a map and also by air, but now on the ground, it all just looked like endless beach running. And it kinda was. The nutrition plan was consistent with all my long runs: stop every hour, take an S-Cap and a Gel, and take sips of my diluted Carbo-Pro Water along the way. Bob had a similar plan as well, except he preferred to eat Cliff Bars along the way instead of going with all gels. We eventually hit a hard packed beach and saw a landmark, you could not miss: Calvin Falls. We knew now that we were about half way through our journey. After a few token photos, we ran on, following the footprints of three bears in the sand. The sight of bear prints in the sand did not scare or, nor surprise us. The prints were going the same way as we were, and provided that we just kept our heads up, we would be fine. We carried along at the standard pace, and the scenery was now getting a little monotonous with seeing ocean on our right, beach on our left, and the combination of rocks and shelf infront of us. At one point, we thought we saw a sealion in the distance, but alas, as we got closer, it was just a rock that looked exactly like a sealion. A marine mirage. Later we would hear that this corner was actually Bajo Point, just past the half way point. Occasionally, we would cross a small river along the way, but we found it really difficult to relate where we were in conjunction with the map. However, we eventually got to a bay that had two rustic native dwellings on it (with solar panels! ), so we knew that we were at Beano Creek. 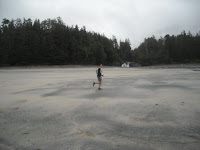 This was the final stretch of beach running, and the inland trail lay only about 1k ahead. Shortly after Beano Creek though, something then happened I will remember for the rest of my life. As we were running the shelf, I planted my left foot on a rock that can only be described as a 45 degree skateboard ramp. The ramp dropped on the other side. As I planted, I completely slipped on that foot (and my entire weight was on that foot), and I went down. And went down hard. As I fell, I got my hands down to cushion my fall and pretty much got my face drenched in saltwater. I felt an acute pain in my leg and Bob asked me if I was ok. I told him that I needed a minute and I was now clutching my leg. Bob asked me if I was hurt and I said I thought my leg was hurt. I then took a look at my hands briefly only to see them covered in blood. I took about 2 minutes to put direct pressure on my leg. Without a first aid kit, direct pressure was about the only strategy I had to stop the bleeding. Bob and I now took a look at my leg and it was a small puncture wound that went deep all the way into my tibia. Apparently it now appeared that my leg smashed against the skateboard ramp that had a barnacle placed on it. While my leg was the main concern, I was also bleeding outta both palms. Bracing my fall meant driving my hands into a couple of the local periwinkles. My left hand wasn't bad at all, but my right hand had a deep cut on it. Cool. More blood. It was only sheer luck that I decided to wear a long-sleeve running shirt that day. Now, Bob was using the edge of a mussel shell to cut open my shirt along the seam. The plan worked, and we now had a bandage that I tied tightly to my leg. I got up and tried walking. I could walk. There certainly was pain from my leg, but it wasn't too too bad. After a minute, I tried jogging and I could do it. At this point, I had regained hope that I was going to finish the trail. For a moment there lying on the shelf, I had my doubts. We now followed bear prints again in the sand that took us to the inland trail marker. The trail was again similar to the previous inland trails. There was maybe a little more runnable terrain now, but there was certainly enough blowdown to keep us from getting a good pace on. Also did I mention ropes? Well there were around 12 of them in this section, and you needed most of them going up and down the scramble sections. My leg only hurt when I had to jump down (and this was fairly often), and my right hand would not stop bleeding. This run required your hands to navigate through the trail. I was relieved that in about an hour, my right hand finally settled down and stopped bleeding. The rest of the Nootka Trail now was sections of hilly trail and small pocket beaches. I think I counted about 8 pocket beaches in total. We got excited when we saw a sign that said Maquinna Point, because we thought we must be close to the end. However, as is the case in many long runs, the end is always a little further than one would always like. So on we slogged. 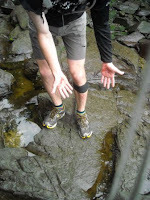 In fact, as the trail got on, my leg became a non-issue. I was feeling great physically, and my body was showing little sign of fatigue and no sign of cramping. I still led, and bob now looked like he was lagging a little behind me. Perhaps it was because I knew the end was near, but I was actually ready to hammer the last little stretch of trail. We passed a few hikers at this point, and I assumed that they were hiking their way out to the ferry. This only encouraged me more. But as the trail popped out of the woods, we were now at the edge of a river, and Bob and I questioned if we had taken a wrong turn somewhere. The trail was not completely obvious to us which way to go. We backtracked slightly and tried to follow some footprints, but it didn't help us much. We decided that we had to cross the river, and it was deep. At the deepest point, it came up to my hips, but we did make it across. Now across the river, we followed some footprints up to a trail that now went inland. We followed this trail for quite some time now, and came to a saltwater lagoon. The trail now, was nowhere to be seen and we had no idea where we were. Bob was tempted to bushwhack through the forest in the obvious direction, but I was the voice of reason, and led the way back to where we crossed the river. We now took the direction of the beach and before too long, we saw footprints again headed the same way as us. Shortly thereafter, we could see people ahead in the distance and a lighthouse way in behind them. We passed the people, ignoring the strange looks we were given, and found an old ATV/Quad Trail that seemed to be going the right direction. We saw more people now, and we were definitely on the home stretch. I could now see an old church now at the end of the road and my parents were up there, now excited to see us. We finished the trail in 5:40. With the exception of the viscous fall I took, it was an extremely strong run for me. Now, the dream was complete. The 4 major coastal trails had been completed. We took the ceremonial finishing photo, then got on some warm clothes and refuelled with some bagels and Powerade. The ride home on the UChuck III boat was relaxing and scenic, but also very slow. At this point, I was keen to just get home and rest. And eventually, I did just that. The nootka Trail was 40k in distance. I'd say it was 3/4 beach running and 1/4 trail running. 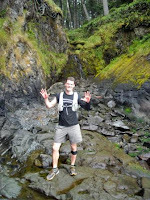 The trail sections resembled the North Coast Trail more than anything else (ie. 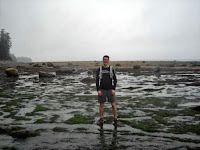 hard), while the beach sections were more like the West Coast Trail (ie. manageable). Now with this trail complete, it only begs the question: What is next? Great run man ! Wanneta and I will be running the trail on Tues, sept 5tth,we are going to fly in and out,do you think we can do it in 8hrs,her husband Graei is coming as well,what map did you use? We should do a run some time! We used the Nootka Map we found in our "Coastal Hikes" book. The author is Philip Stone. It has a great maps of all the coastal running trails, but to be totally honest, you don't need a map for this one. One you are dropped off, you just follow the trail to the coast and follow the trailhead buoys and coastal beach to the end. Bob and I did make a wrong turn at the end (after wading through a river)...we should have stayed totally on the coast right until the finish. The trail is 35-40k. There are no markers obviously, so you will just go by time. 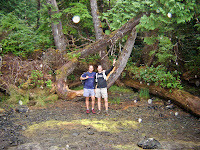 Best of luck and just know that the trail portion of Nootka is like the NCT (ie. ugly). Coastal sections are like the WCT. Let me know after how it all goes down and go kick some a$$! Hi Jeff ! We are going on Friday Jeff the 11th ,better weather,nice feet buddy,what are the tides for that day like !Tell me more about the wrong turn ! We took a wrong turn after Maquinna Point...maybe like a couple k after? There was a river we had to cross that was waist deep - this is the right way to go, but we should have stuck to the coastline after the river crossing. We went inland instead up a grassy quad trail and it led to a lagoon. That was the wrong way. When you cross the river, stay to the coast (you can also see the lighthouse in the distance). We didn't find the trail too bad really. 5:40 is the time to beat. All 4 trails completed ,Wanneta and I did it in 7hrs 39 mins, the tides didnt cooperate with us !! 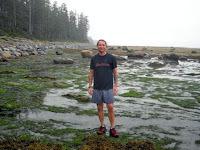 !I took a really bad fall as soon as I got to third beach ,we did more trail than you guys I believe, what a beautiful place , thanks for inspiring me to do this run at the age of 54, thanks for leading the way bro ! Awesome job dude. Broght back alot of NCT memories, eh? Your time was actually a little faster than I expected, especially since the tides didn't really cooperate and the fact that you fell. You guys pulled off a wicked time on a wicked trail. Congrats! Thanks Jeff ! You and Bob rock this trail, I think that this was the most beautiful trail of them all !Joanne the lightkeeper said that Bob and yourself and us are the only ones to do this run in one day! I will be going over to the Frosty 50 with Carlos this weekend hopefully the knee will heel by then!